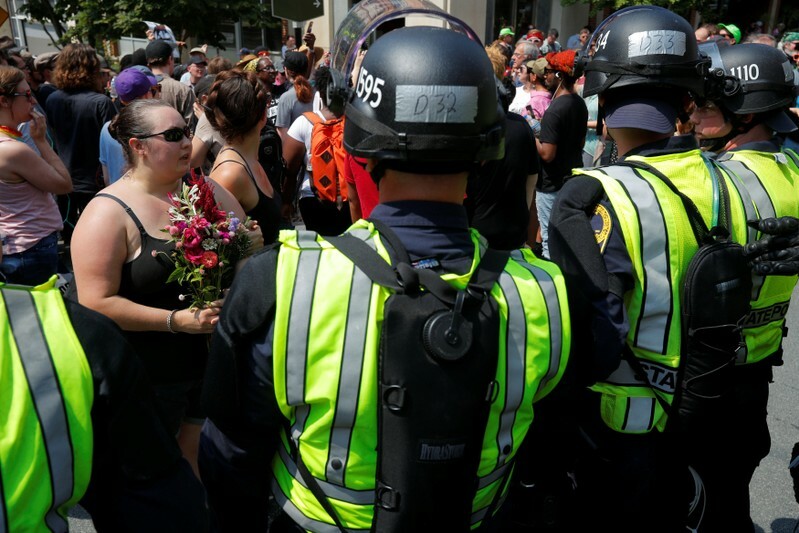 WASHINGTON (Reuters) – Police were out in force in Washington on Sunday ahead of a white nationalist rally that was organized to coincide with the anniversary of last year’s racially charged violence in Charlottesville, Virginia. The “Unite the Right 2” event was set to take place at 5:30 p.m. (2130 GMT) in Lafayette Square, across the street from the White House. Several demonstrations by counterprotesters, who were expected to outnumber the white nationalists, were being held nearby. 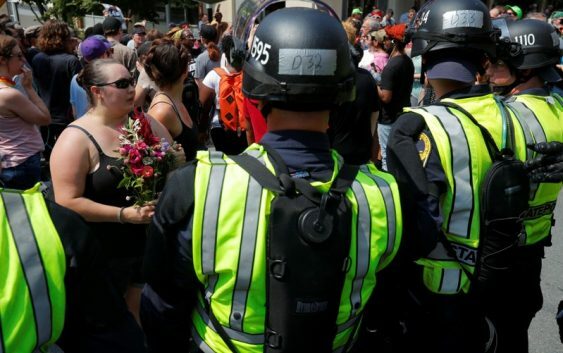 There was an enormous police presence to keep both sides apart and avoid the street brawls that broke out last year in downtown Charlottesville. A local woman, Heather Heyer, was killed when an Ohio man, James Fields, drove his car into a crowd of counterprotesters. In Washington on Sunday, counterprotesters organized an afternoon program of music, speeches and poetry readings at Freedom Plaza, east of the White House. Sean Kratouil, a 17-year-old who lives in Maryland, was wearing a vest with “Antifa” on the back and said he was there to help start a movement of peaceful anti-fascists. He said he was concerned that when rallies turn violent, it makes his side look bad. “Public perception is key,” he said. Counterprotesters also gathered near the Washington suburban metro station of Vienna, Virginia, where about 20 white nationalists carrying American flags were escorted onto a train to the city. Some counterprotesters yelled “Nazi scum!” at them as they were shepherded through the station. The group was led by the organizer of “Unite the Right 2,” Virginia activist and blogger Jason Kessler. Dressed in a blue suit and carrying a megaphone over his shoulder, he said the rally was aimed at advocating for “free speech for everybody,” and he blamed last year’s violence in Charlottesville on other groups and the media. “I’m not a white supremacist. I’m not a neo-Nazi,” Kessler said as the train rolled towards Washington, where hundreds of counterprotesters and more police awaited his group. In the picturesque college town of Charlottesville, hundreds of police officers had maintained a security perimeter around the normally bustling downtown district throughout the day on Saturday. Vehicular traffic was barred from an area of more than 15 city blocks, while pedestrians were allowed access at two checkpoints where officers examined bags for weapons. Hundreds of students and activists took to the streets on Saturday evening. Many of the protesters directed their anger at the heavy police presence, with chants like “cops and Klan go hand in hand,” a year after police were harshly criticized for their failure to prevent the violence. Earlier on Saturday, a group of anti-fascist protesters walked through the downtown area, holding signs with messages like “Good Night White Pride.” But the day was largely free of confrontation. On Sunday morning, activist Grace Aheron, 27, donned a Black Lives Matter T-shirt and joined hundreds of fellow Charlottesville residents who gathered at Booker T. Washington Park to mark the anniversary of last year’s bloodshed. “We want to claim our streets back, claim our public space back, claim our city back,” Aheron said at the park.